CLICK HERE TO WATCH HIGH THERE NOW! Hardened tabloid-TV veterans are protesting the harsh treatment of a New Jersey wedding photographer caught growing 17 pot plants. Jon Peditto (the son of John Parsons Peditto, former news director at Channel 5’s “10 O’Clock News” and co-creator of “Hard Copy”) was sentenced Friday in Toms River, NJ, to eight years for drug manufacturing and distribution. Kearns blames New Jersey’s “outdated” and “draconian” marijuana laws, and said Peditto is being punished because he declined to cop a plea. HOLLYWOOD (January 31) The producers and stars of the independent gonzo comedy film High There have issued an urgent plea to fans, friends and colleagues to help fund the appeal for jailed New Jersey cannabis activist Jon Peditto. Peditto's family and friends are asking for contributions at the FundRzr site: JonPedittoDefenseFund.com. Peditto, a New Jersey photographer and gardener, was convicted in October of maintaining a drug production facility for growing 17 marijuana plants in the New Jersey Pine Barrens. Under New Jersey sentencing guidelines, he faced a mandatory minimum sentence of 10 to 20 years in prison. On Friday, sentencing Judge James Blaney, agreed to handle the first-degree conviction as a second-degree offense "in the interest of justice." Even so, he sentenced the 54-year old Peditto to eight years in prison. He will be eligible for parole after about two years. 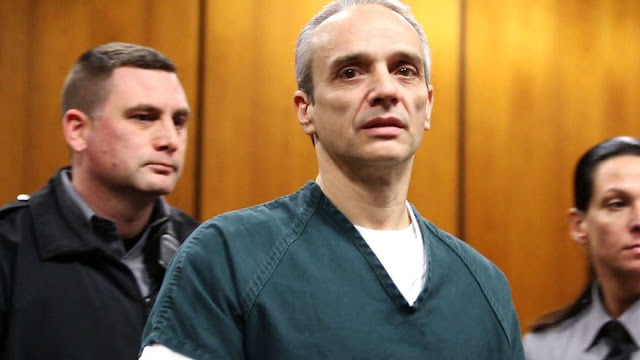 "He no longer falls under Christie's mandatory minimum sentence, but it's still bad," Peditto's father, acclaimed, award-winning journalist, television producer and filmmaker John Parsons Peditto said after the sentencing. 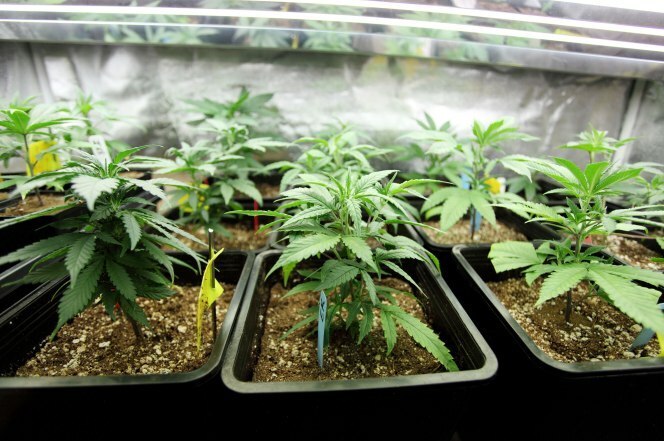 "Growing ten plants is a misdemeanor. That means he's getting about a year per plant." Peditto was arrested in 2012 and admitted growing the plants for his personal use. He rejected offers of a plea deal, and used his trial to challenge New Jersey's outdated drug laws. "Jon Peditto is a gentle man. He does not belong in a prison, especially not for a nonviolent crime that would be rewarded in other states," said High There producer Burt Kearns. "I'm really surprised and disappointed that the news media don't find this to be a major story -- especially since Jon's father was a mentor to and influence on so many people in the news business today." High There director and star Wayne Darwen, who stars as "Dave High" in the BRINKvision film, called on his fellow celebrities to support the Jon Peditto cause. "More than few celebs from New Jersey like to flaunt their 420 credentials," Darwen said. "I challenge these stars, including Bill Maher and Kevin Smith, to open their mouths, raise their voices, and open their wallets and raise money to make this right." "New Jersey's marijuana laws are cruel and unusual, archaic and draconian," said High There executive producer Sam Peters. "Every casual or occasional marijuana user -- every person relying on marijuana for medical reasons-- is at risk. You could be next." In New Jersey, marijuana is classified in the top tier of dangerous drugs, on the same level of heroin. New Jersey's governor and presidential hopeful Chris Christie has said he considers marijuana to be a "gateway drug" and vowed that if elected president, to vigorously enforce the federal marijuana ban in states where it has been legalized. Darwen and Kearns are longtime colleagues of Peditto's father and, along with fellow director and co-star Henry Goren, have championed Peditto's cause since his conviction. High There is rooted in activism, focusing on the case of Roger Christie, the founder of Hawaii's THC Church, who was arrested on marijuana possession and trafficking charges and jailed for four years without trial. Christie was released to house arrest days after High There's premiere. Movie Reviews 101: “Party time! HIGH THERE is one to try!" 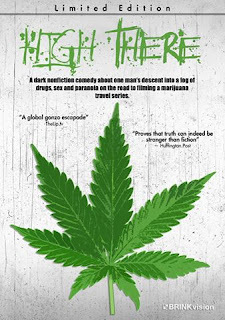 Plot: A real-life attempt to film a reality television pilot turned into the most unreal experiences of a lifetime for veteran journalist and producer Wayne Darwen and videographer Henry Goren, when they found themselves transformed into the characters Dave High and Roland Jointz in an accidental immersive investigation of the marijuana wars on the island of Hawaii. Story: High There starts as David High a journalist and his cameraman Roland Jointz head to Hawaii to shot a new travel show but along the way David enjoys drugs, drinks and woman as they go to make their own story. It isn’t long before David and Roland find themselves being followed around the island as the island looks to clean up the drug problems on the island. Dave goes around different ideas to make his show work but just can’t shake the drugs every day, where he makes each outing a party. David continues to learn about a bigger problem on the island dealing with marijuana. High There is a documentary that wants to tackle the real problem of marijuana on the island in Hawaii, we only see small parts of this with most of the film being David High just wanting to smoke drugs and get drunk, this really takes away with what we want to learn about and it turns into just the life experience of the two men on the island. Not being a fan of drug usage I personally didn’t enjoy the almost glorification of using them during the adventure the men go on. Director Review: Wayne Darwen – Wayne puts together the trip well to show the good, the bad and paranoia drugs cause people. Documentary: High There is a documentary which also happens to play out as party holiday for David. Settings: High There uses the Hawaii settings but most importantly showing how it isn’t all beauty we get led to believe. Best Part: Seeing the dark side of Hawaii. Worst Part: Too much drug usage. Believability: Based on the real trip the two men had. Trivia: Director, writer and star Wayne Darwen is a celebrated tabloid newspaper and television journalist and producer who was the inspiration for Robert Downey Jr.’s character “Wayne Gale” in Oliver Stone’s 1994 film, Natural Born Killers. Overall: Documentary that feels like it is a film party for the men involved. 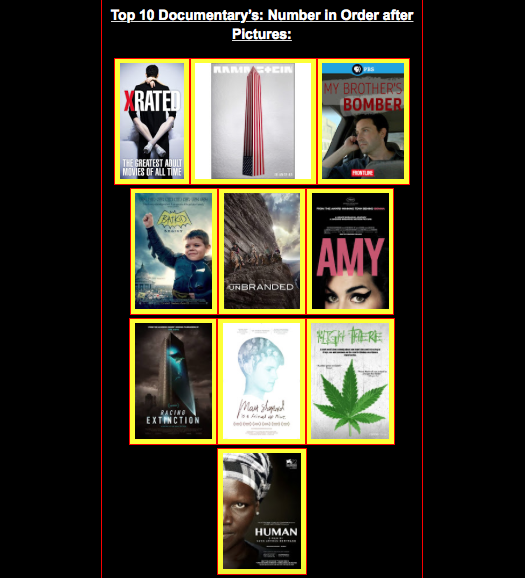 HOLLYWOOD (JANUARY 23) -- A major twist has been thrown into the 2016 Hollywood awards season as the independent nonfiction gonzo comedy film High There has been named one of the Top Ten Documentaries of 2015. The accolade comes from the respected independent movie review site, A Bucket of Corn, and has led to great controversy because High There, overlooked by the mainstream documentary community, has been ranked higher than other big-budget, ultra-hyped films, including Amy, the Amy Winehouse documentary that has been nominated for a 2016 Academy Award®. "We're delighted," the film's executive producer Sam Peters said today in Los Angeles. "High There has touched many people, and an honor like this will only lead others to seek it out." Added director and star Wayne Darwen: "We made the Bucket List! Nice!" High There is a Sam Peters International Productions Unlimited and Good Story Productions presentation of a Rat Lung picture. High There was directed by Wayne Darwen and Henry Goren, and was released on VOD and limited edition DVD by BRINKvision in June 2015. 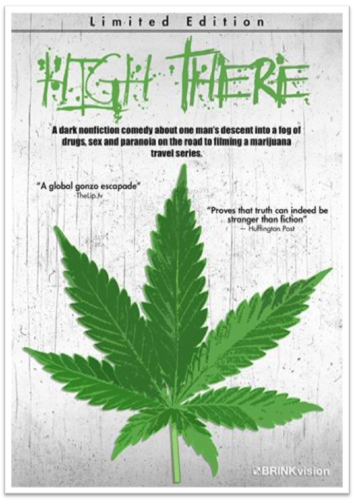 Winner of the 2015 People's Choice Award at the first annual Cannabis Film Festival in Humboldt County, California, the film is available for sale on limited edition DVD on every sales site from Amazon.com to Walmart.com, and On Demand on platforms including Amazon.com, Vimeo.com, Fandor.com, and most recently, Google Play. Find additional photos and information at hightherethemovie.blogspot.com. Several weeks into 2016, amid the Hollywood awards season, comes exciting news: High There has been named one of the Top Ten Documentaries of 2015. Now, High There is listed in the #4 position -- ahead of Academy Award nominee Amy and other, big-budget, ultra-hyped movies. "All movies don't have to be put out by Hollywood or the elite makers of cinema, for movies are movies. © MMXIV, MMXV High There Partners. Watermark theme. Powered by Blogger.